Achilles tendonitis is also known as Achilles tendinopathy or Achilles tendinosis. It is an overuse injury causing pain, inflammation or degeneration of the Achilles tendon at the back of the ankle. If not caught early this can be a difficult injury to cure. But with the right treatment and particularly eccentric strengthening exercises, a full recovery can usually be achieved. Symptoms of Achilles tendonitis consists of pain and stiffness in the Achilles tendon at the back of the ankle. Symptoms will most likely have developed gradually over time and will often be worse first thing in the morning. 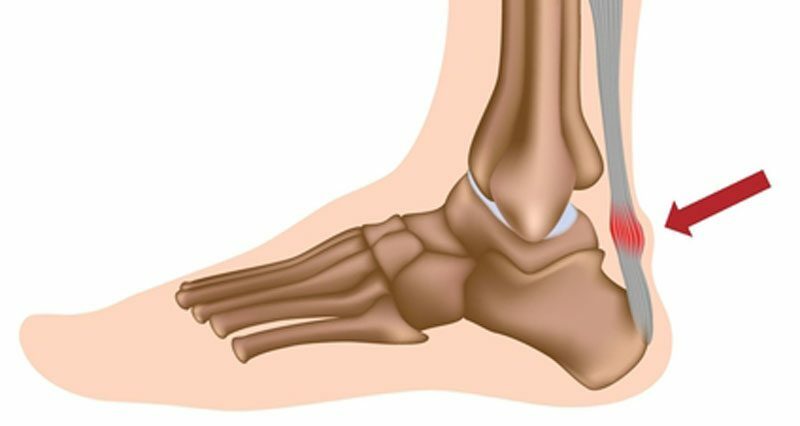 Achilles tendonitis can be either acute or chronic. Acute achiiles tendonitis symptoms develop gradually over a few days. You will feel pain and stiffness in the achilles tendon at the back of the ankle. It will be particularly painful first thing in the mornings, or after a period of rest. Then, as your tendon warms up the pain will go. However, if is likelt to return later in the day or after a prolonged training session. Your achilles will be very tender when palpating (feeling) or squeezing it from the sides. You may also feel a nodule or lump in the middle of the tendon. Chronic injuries may follow on from acute Achilles tendonitis symptoms, especially if it goes untreated or is not rested. This is difficult to treat, particularly in older athletes who appear to suffer more often. There will be a gradual onset of Achilles tendon pain over a period of weeks or even months. The pain will come on during exercise and is constant throughout the training session. You will have pain when walking, especially uphill or upstairs because the Achilles has to stretch further than normal. Chronic achilles pain does not necessarily prevent activity but can niggle away affecting performance. In the long-term this may be a precursor for something more serious, such as a total rupture. An MRI or Ultrasound scan can determine the extent of the injury and indicate a precise diagnosis. How bad is my Achilles tendonitis? The VISA Achilles tendon pain questionnaire has been designed to measure progress during rehabilitation. Simply answer a few questions to get a score out of 100. This is an estimate of how bad your injury is and can be a good way of measuring progress. The Achilles tendon is the large thick band of tissue at the back of the ankle. It connects the calf muscles to the back of the heel. Huge forces are transmitted through the tendon when walking and running. Tendonitis suggests inflammation of the tendon (‘itis’ means inflammation). But in reality, few injuries are actually down to pure inflammation. The main finding, particularly in older athletes is usually degeneration of the tendon. Thererfore, the term tendinopathy is probably a better term to describe the range of conditions that can cause Achilles pain. The main cause, particularly in older athletes is degeneration or wear and tear of the tendon. Another condition which has identical symptoms is Tenosynovitis. This is inflammation of the sheath surrounding the achilles tendon. Overuse is the primary cause. However, there are a number of factors which can increase your risk of injury. Overpronation is when your foot rolls in too much (flattens) when you run. If you overpronate then as your foot flattens, the lower leg rotates. As a result, your achilles tendon twists, increasing the forces through the tendon. This makes it more susceptible to overuse injury. A podiatrist can perform gait analysis to identify any biomechanical issues and correct them with orthotic inserts which are worn inside shoes, or for less severe cases advising on correct footwear for your running style. Make sure you have the right running shoes for your foot type and the sport. Many specialists running shops will do gait analysis and have experience of advising the correct shoes. A worn out shoe or one that does not provide enough support can increase the strain on the Achilles tendon. If you overpronate then you would probably be more suited to a ‘motion control shoe’. This has a midsole which is firmer on the inside to resist the foot rolling in. If you wear high heels regularly, this causes the Achilles tendon to adaptively shorten over time. Then, each time you wear your flat running shoes the tendon is being asked to stretch further than normal. Avoid overtraining. Modify training methods to prevent your injury from returning. Running on soft surfaces, or sand is not great, because it allows the heel to sink. As a result the achilles tendon is forced to stretch further. If you are a runner then increase your weekly mileage gradually and by no more than 10% per week. If you regularly run uphill or on a treadmill set at an incline, the achilles is continually overstretching. This again increases the risk of injury. Treatment for acute injuries includes rest and application of ice or cold therapy to reduce pain and inflammation. More chronic injuries may respond better to heat treatment with a strict 12-week heel drop exercise program which has been shown to be effective. For an acute injury applying ice for 10 minutes every hour or so reducing frequency as required for the first 2 to 3 days can help reduce pain and inflammation. Rest is important so try to stay off your feet as much as possible. Wearing a heal lift or heel pad (in both shoes) can help reduce the strain on the tendon by shortening the calf muscle very slightly, although this should only be done as a short-term measure. A simple Achilles tendon taping technique can be used to take the strain off a painful Achilles tendon allowing it to rest more easily, especially if you have to be on your feet. A long-term chronic Achilles tendon injury may respond better to the application of heat, again applied for 10 minutes every couple of hours as required. Applying gentle self-massage to the Achilles tendon may also be beneficial. If Achilles tendonitis has been a persistent problem then the Hakan Alfredson’s heel drop protocol exercises have been shown to be effective in up to 90% of patients. They involve performing a heel drop exercises 180 times every day for 12 weeks during which time pain may actually get worse before it gets better. Gentle calf stretching exercises can help stretch the muscles and aid recovery. A plantar fasciitis night splint is worn in bed and is excellent for preventing calf muscles tightening up overnight. A professional practitioner or Doctor may prescribe anti-inflammatory medication, such as ibuprofen, which might help with acute Achilles inflammation and pain but has not been proven to be beneficial long-term and may even inhibit healing. Application of Electrotherapy, such as ultrasound can also help reduce pain and inflammation and sports massage can help mobilize the tissues of the tendon and relax the calf muscles. They can also identify possible causes such as biomechanical problems with the foot, which may be contributing to the chance of injury. The Hakan Alfredson’s heel drop protocol exercises have been shown to be effective in up to 90% of patients suffering from Achilles tendon pain and involve the patient dropping the heel to horizontal in a slow and controlled manner. The athlete performs an eccentric heel drop exercise on a step going up with both legs and slowly lowering the heel to the horizontal position. Eccentric exercises are those where the muscles (in this case the calf muscles) get longer as they contract. Exercises are performed twice a day to a total of 180 repetitions and continued for 12 weeks. Pain may often get worse over the 12 weeks before it starts to get better. Expert interview: Sports Physiotherapist Neal Reynolds explains his approach to Achilles tendon rehabilitation exercises. Read more on Achilles tendon heel drop exercises. We have a number of resources to help in the recovery of Achilles tendonitis including our 12-week exercise check sheet and our downloadable VISA Achilles pain questionnaire, which is a great way to monitor how bad your injury is.